Recalled by burning Guy Fawkes? In my youth we had a bonfire at the end of the garden, and my dad set off a few fireworks like Roman Candles, Volcanoes and Helicopters. I remember my brothers making a guy (an effigy of a man, made from old clothes, and stuffed with newspaper or straw) to burn on the fire when I was very young but I don’t think that continued for very long. I don’t recall making one myself. We were allowed to hold sparklers in our woollen-mitted hands, and we’d wave them around carefully, writing our names in fire writing. Foil-wrapped potatoes would be put in the embers of the fire to cook. The last fireworks of the night were one or two rockets, but there’d also be a Catherine Wheel near the end, since that had to be tacked to a post to enable it to spin properly. I think Catherine Wheels were my favourites. I didn’t like anything that went bang! In those days everyone celebrated on November fifth, and some places had joint or village parties. It was the only time of year we ever had fireworks. There would be reminders on the radio to put our pets in safe places and to shield them from the noise. We would have a cake/biscuit called parkin to eat afterwards, with a cup of cocoa or soup and the baked potatoes if they had cooked enough. I don’t know what happened to them if they hadn’t. These days people celebrate for days with Bonfire parties, making sure they don’t clash with anybody else’s, I think. If held in advance they get all mixed up with Halloween parties. 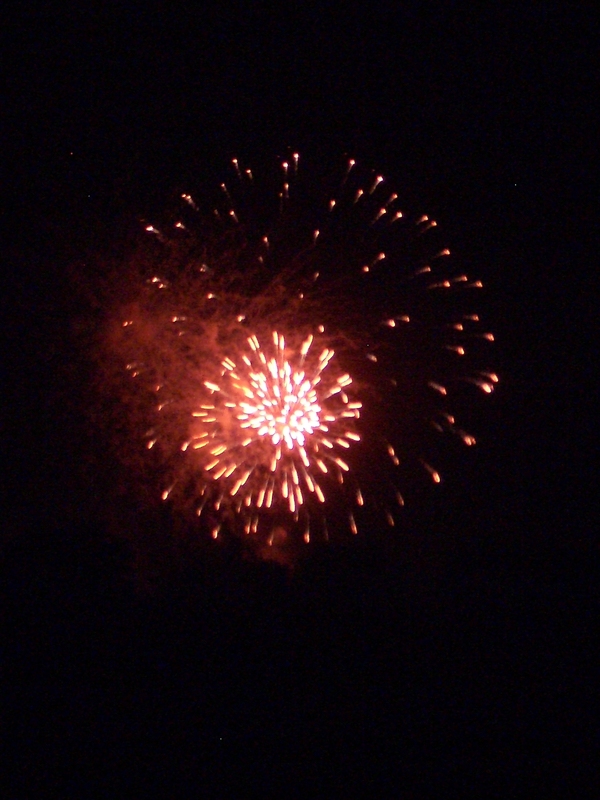 Fireworks seem to go off every night for weeks, and at any time from 6 (reasonable) to past 10 pm (totally anti-social). It also seems that everyone has to have fireworks at the end of wedding receptions, so we get fireworks, sometimes at both ends of our village, every Saturday, most Fridays and some Thursdays, all the way through the summer, if our hotels are doing good business. No wonder I hate fireworks. Pretty, but they should be de-banged. And preferably banned! For a reasonable explanation of why Guy Fawkes got all the blame for trying to blow up the Houses of Parliament in 1605, see Wikipedia.